My okra plants are taller than me…ya, not hard to do, but still impressive to me. Coming from Oklahoma, I looooove me some fried okra. But I wanted to find better and healthier recipes for preparing okra. With a bumper crop of okra, I have been trying to find different ways to preserve them. I have frozen nearly four gallon bags of these puppies, waiting to make gumbo this fall. I decided to try my hand at pickling okra also. These are a fabulous snack and pretty too! It’s a lot easier than you would think. The smaller okra pods work best, but as you can see from my photos, I allowed my okra to get a little too big and went ahead and used them anyways. They just aren’t as tender as the babies, but they still are tasty tasty. I used the recipe from my Ball Preserving book. They even have a homemade ketchup recipe in there….mmmm…tempting. Materials: You will need 4 clean and sterilized pint mason jars with lids (band and clean lid). A funnel may also be useful, but not necessary. Prep: Trim stems of okra but leave whole, being careful not to cut into pods. For the larger okra, I went cut them up. 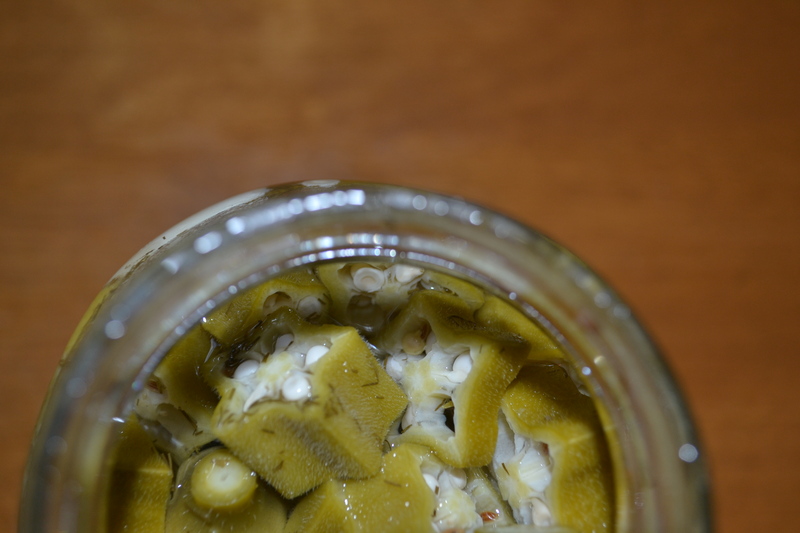 The downside of this is that you will have a bit of slimy goo from the okra in your jar, but it still tastes fine. The smaller pods are still better. After you have prepped your okra, set them aside. Make Brine: Combine salt, dill seed, water, and vinegar in a large pot. Bring to a boil. 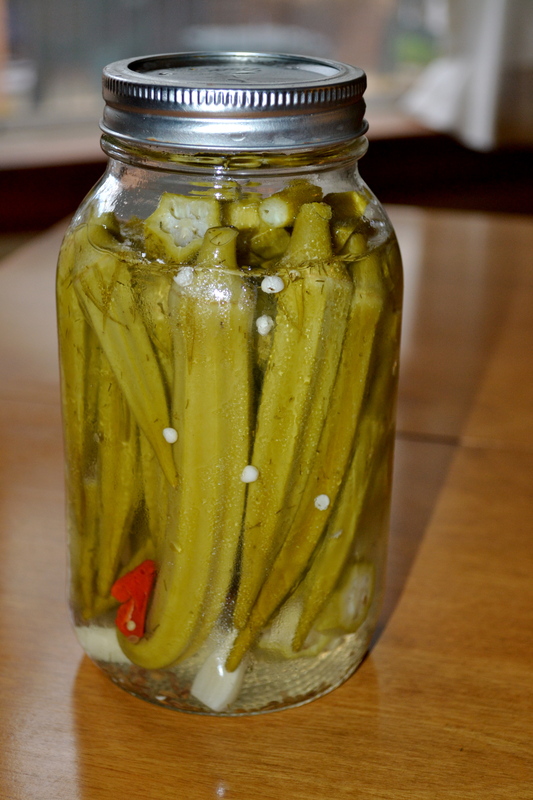 Pack: Pack okra into the hot and clean jars, leaving about 1/4 inch headspace to allow for heat expansion. Shove 1 clove of garlic and 1/2 pepper in each pint jar. Finish ‘er up: Ladle the hot brine liquid over okra, leaving 1/4 inch headspace. Add the cap and band. You can heat in a hot water canning bath for 15 minutes to seal completely….OR allow to cool for 15 minutes and then place in refrigerator for fridge pickles. They should be ready to eat within a week.